It’s Day 30 already (just one more movie left) and we’re talking about The Conjuring!! I need to point out that I consider Insidious to be one of the scariest movies of this decade so far. I bring that up because it’s also from director James Wan and shares many of the same styles (and even actors) as The Conjuring. Insidious scared the heck out of me when I watched it in theaters and I had a hard time sleeping for days. I really wanted to see The Conjuring in theaters, but I just never got around to it. This was much to the chagrin of my friend Robert because he loves horror films, too, and we share many of the same tastes in movies. This year, after he remembered that I hadn’t seen it, he decided he’d buy me the blu-ray version of it for my birthday (as well as a few other scary films, including the 3D version of Dial M for Murder) and wanted to watch it with me at my house. This meant that my wife would also be watching it and as you may recall, she HATES scary movies. But she agreed because it was for my birthday. Now, after having watched it… wow. It follows a couple of real life case files from the Warrens, who were actual paranormal investigators in the 1960s and 70s. The first case (and the opening of this film) is the story of a possessed doll named Annabelle. The second case (and main storyline) is about the event that eventually inspired The Amityville Horror. It’s about a family that begins experiencing supernatural occurrences, including strange noises and freaky apparitions, not long after they move into an older house. They hire the Warrens to investigate it and well, to say much more would spoil a lot of the fun. James Wan really understands horror films, and knows that long takes and fluid camera movements can really amp up the suspension, which is then released with a sudden loud noise or movement on screen. These often catch you off guard and make you laugh at yourself for screaming out loud. This movie is AT LEAST as scary as Insidious, and when you take into account the “inspired by true events” aspect of it, it may, in fact, be the better movie. It’s also a bit leaner and doesn’t have an ending that feels out slightly of left field (as some people felt was the case with Insidious. I disagree with those people, however). 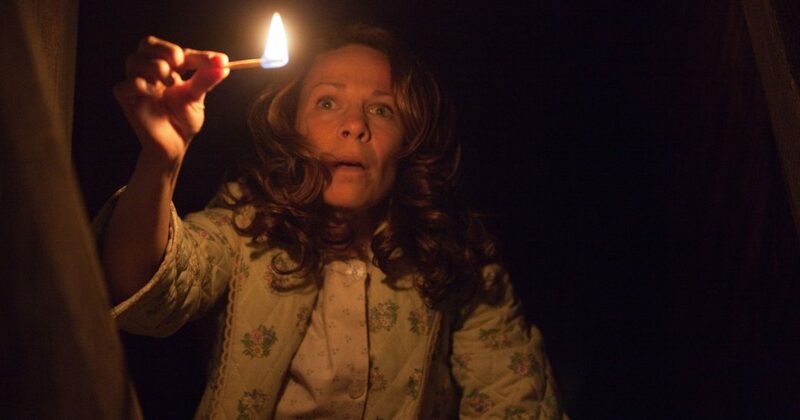 Needless to say, I thoroughly enjoyed The Conjuring (and my wife thoroughly hated it, natch). It reminded me a lot of Poltergeist and other haunted house films, too (maybe even The Haunting). It seems very much rooted in a more classic style of filmmaking and that makes it stand out to me. It’s impressive on every level and I loved it. There’s little gore on display here, and that really works for this material. Thanks to my friend Robert for turning me on to this movie. I’ve got to catch up and watch The Conjuring 2 and the spin-off film Annabelle. Tomorrow, we will close out this whole thing with M. Night Shyamalan’s The Visit! !